So, that Pixel 3 XL notch... what do you think about it? Well, folks, we know it came as a shock and a surprise, but all these Pixel 3 XL leaks, all the devices that were sold somewhere on the black market, and everything we knew beforehand... well, it turned out to be correct. The Google Pixel 3 and Pixel 3 XL were just announced yesterday and there were no surprises. This includes that notch on the Pixel 3 XL... a lot of people were hoping that's an elaborate troll and Google was keeping an ace up its sleeve. But no, the phone is exactly what we saw in all the leaks before. There is a huge group of people out there that absolutely hate the cutout on the Pixel 3 XL. Its design makes it look bigger than it should be, the two cameras and speaker in there make it look like a bad emoji, et cetera. Of course, this group could just be a small collection of anti-notchers that happen to be very vocal. 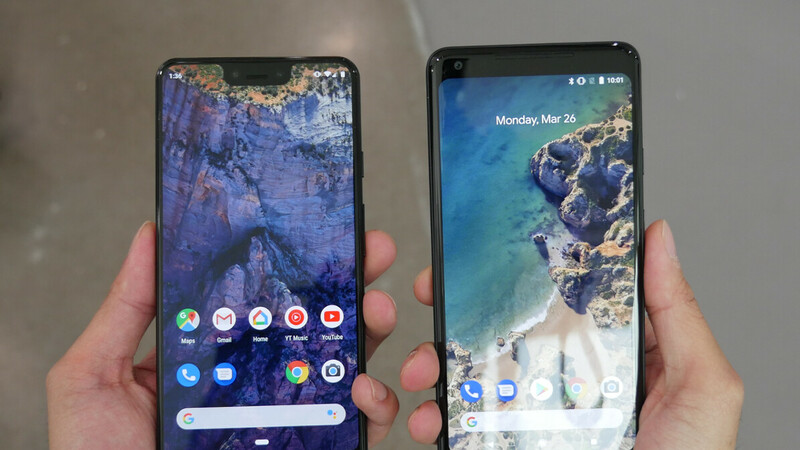 So, here's a poll, voice your opinion — what do you think of that cutout on top of the Pixel 3 XL's display? How do you feel about the Pixel 3 XL's notch? Yikes! Smash it before it lays eggs! Google is done with making smartphones. Nobody will and should buy these kinds of horrible phones period. There are much much better android phones from $150 to $1000 from many other OEMs that actually makes sense. Man, SHUT THE HELL UP! People should buy what the hell they want. well so much for freedom of speech eh brother? If I tell you what I think about this notch, word for word then... I'd definitely get banned so; G'Day! Yup. They decided to copy apple's ugly way of doing things, and cranked it up a notch (pun intended). The worst notch, i've seen in 2018. Hope they'll learn how to listen with cellphone enthusiast that notch is a No, NO. For the next 2019 pixel model be really careful on the design. I don't hate notches the way some people do, for me it's a bit of a "meh, whatever" sort of thing. But the one on the Pixel 3 XL is by far the most offensive one. I would take the Pixel 3 over it any day of the week, just because of the size of the notch. I'm going to go to VZW and see it in person. Then I will make my final judgement. I disliked notches in the beginning but this abomination I just can't get passed. Notches aren't an issue for me, as long as it's subtle. But, this particular one on the other hand is very distracting. IMO Apple had better utilization of the notch in their iPhone X/XS/XS Max, not too big, not too small, it's noticeable, but, it's subtle to where it's not unbearable. Just what "utilization" do you have in mind? So, ANY phone with a notch... what do you think about it? Yikes! Smash it before it lays eggs! Fixed. Horrible. It's not just that Apple themselves are trying to hide the fugly notch by using a background that makes it look like there is none, and it's not even that the Pixel 3 notch is the fugliest on the market today by a large margin. It's mostly that Google has now developed a serious split copycat personality and it can't decide if it wants to mimic the iPhone X's or the Galaxy S8/S9 phones. Really sad. Extremely ugly. But not something one can't live without. The problem here however is that the pixel is underwhelming in almost every way aside the camera. From memory to ram, to design, to battery to vanilla Android to no micro SD to no full cameras (features). Only thing it has going for it is camera quality and speakers. I really hope phone enthusiasts vote with their wallets and skip both Pixel 3s. Innovation is almost gone in the American market, with only two camps left, iPhone and Samsung. The smaller guys used to try and I even miss the quirky, complex clumsiness of Symbian. I really miss having a lot of choices and watching OSs like Windows Phone and Blackberry 10 spring to life, only to wither and die because they weren't "iPhone or Galaxy". Buying either of these unaesthetic hardware turds is telling Google it's OK to copy even the flaws and bruises of the champions. I long for the days of the wild, wild best. Ohh gosh, mine does have notch but GpXL3 is the top notcher off all. Well, Nexus have the greatest looks the best are the Galaxy nexus and LG nexus 4 white... I missed those phone i had. What I just want is that ugly "sleeveless shirt" to fail in Zack Nelson (JerryRigEverything) durability test. They could have put something useful on that huge notch. Maybe like a headphone jack. That notch is big enough! Completely stupid thing to do when you don't even have too. We don't mind bezels on the top and bottom. Yes I know you all are grasping for a new design, but why this one? The notch is the ugliest to happen to Anything with a display. The notch is like the rear view mirror in the front windshield. You actually don't even need the rear view mirror l, just like you don't need a notch. Sony and others need to find a way to either make caneras smaller or start using displays that can be made to be opaque and mount the caneras under the display and then you want to take a picture, a tivating the camera makes the display go clear and you snap. I think you meant transparent, not opaque. No notches, of any kind. Period. They're an eyesore, and an unnecessary compromise with no real return.